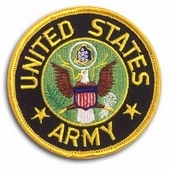 Our U.S. Army patch is a full color, embroidered patch. This is the same patch that is supplied to the U.S. Army, Army National Guard, Army Reserve units, and sold in the Army Post Exchanges. This patch would be a great gift idea and a wonderful addition to your patch collection.